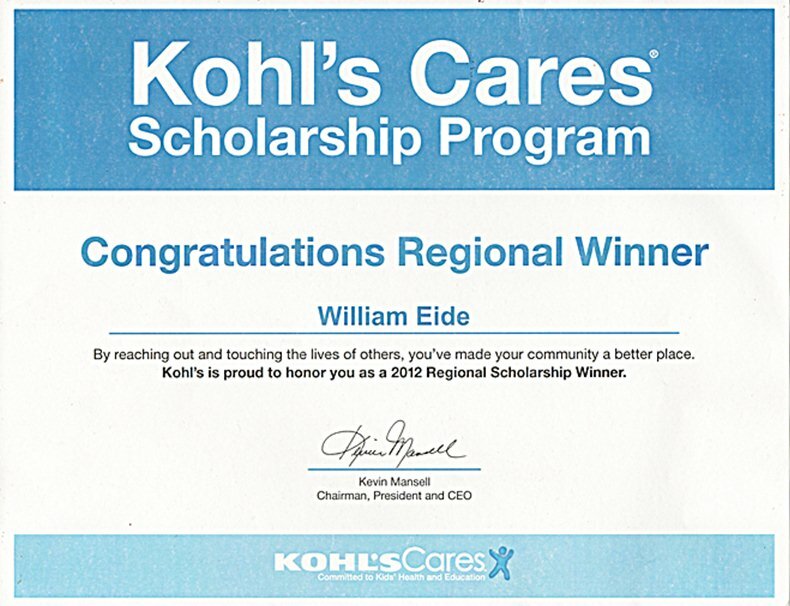 WILLIAM WAS NOMINATED FOR THE KOHL'S CARES SCHOLARSHIP PROGRAM 2012 FOR THE CREATION OF OPERATION TEDDY BEAR-TUSCALOOSA AND WORK THEREIN. HIS EFFORTS TO PROVIDE THE YOUNGEST OF TORNADO VICTIMS STUFFED ANIMALS HAS BEEN VERY REWARDING. JULY 2012 KOHL'S CARES SCHOLARSHIP PROGRAM SELECTED WILLIAM AS A REGIONAL SCHOLARSHIP WINNER FOR THE-STATE OF ALABAMA. HE IS THE RECIPIENT OF $1,000 COLLEGE SCHOLARSHIP TOWARDS THE SCHOOL OF HIS CHOICE.